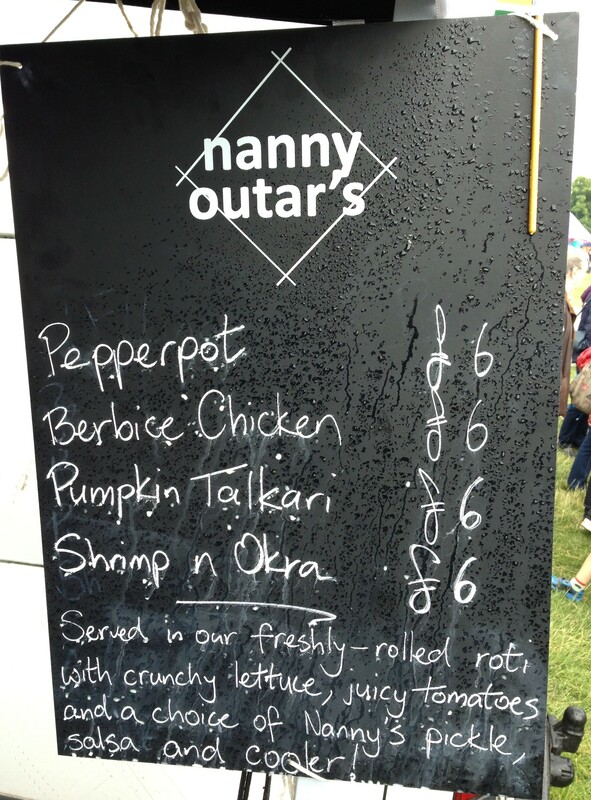 Nanny Outar’s | Restaurants of the World Unite! Me, Horse, Filly and Bat went to find a petting zoo at the Wimbledon Village Fair (http://www.wimbledonguild.co.uk/WimbledonVillageFair/indexWVF.html) this weekend, but were thwarted. If I can’t stroke a pot bellied pig or badger a rabbit then I’m sure as heck gonna eat one. Lucky for me there were a bunch of food stalls kicking around the most exotic of which was Nanny Outar’s, boasting roti wraps. Queuing up in the howling June wind and driving June rain, we quickly learned that these rotis issued from Guyana, which as we all know is in the … south of … western … hmuma..land … on the continent of … *checks wikipedia* South America! Chris Hogan, the man behind Nanny Outar’s, cites is grandmother, the Nanny Outar, as a major influence, having enjoyed her Guyanese cooking since childhood. 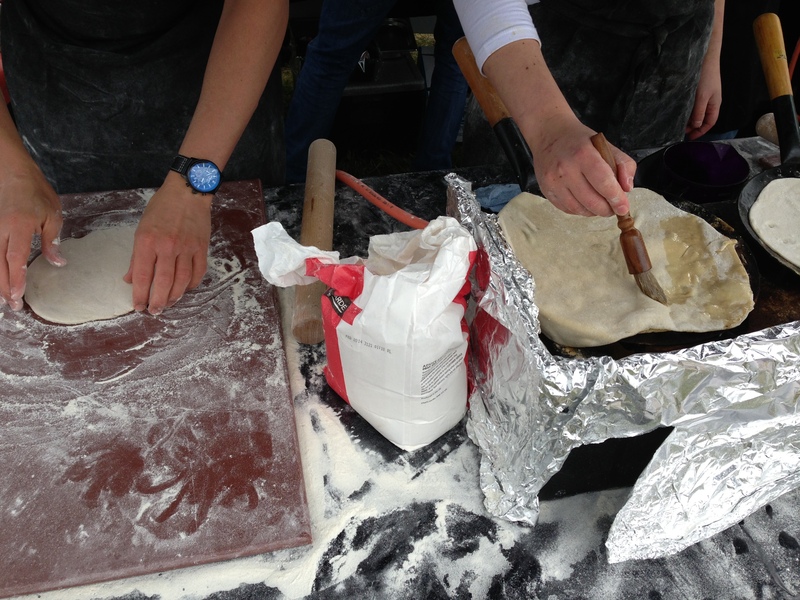 The roti are home made and have been press-ganged into service as wraps which is a jolly good idea. I snaffled a Pepperpot roti, Pepperpot apparently the national cuisine of Guayana and is often brewed for days before serving. Comprising savage lumps of beef tarred in gluey cassareep sauce, it’s surprisingly sweet, smokey, almost treacle like, but balanced by the salad and salsa. 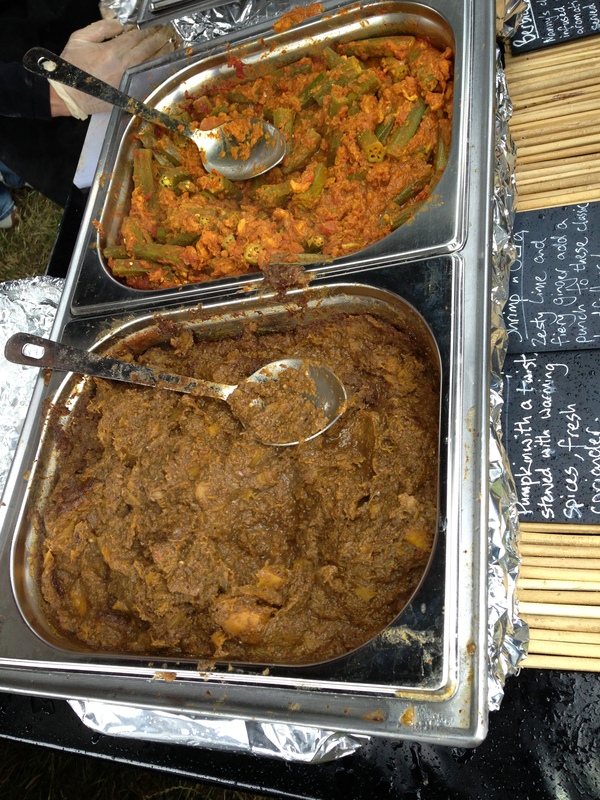 Also on offer were Berbice Chicken, Pumpkin Talkai and Shrimp n Okra, but one for £6 will be enough. 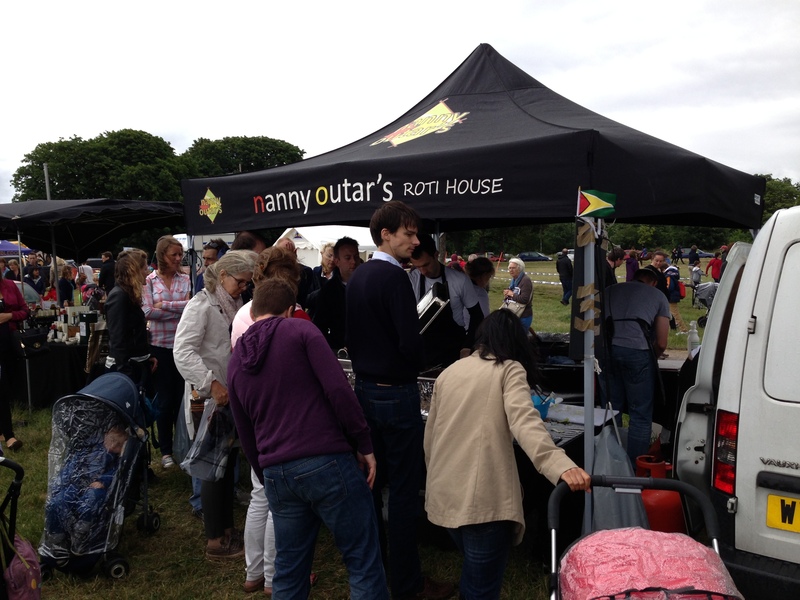 Look out for more Nanny Outar’s at : Greenford Carnival – 29th June; Lambeth Country Show – 20th & 21st July; One Love Festival – 16th, 17th and 18th July; SW4 24th & 25th August; and Stockwell Festival – 7th September. One can only hope that a restaurant is in the offing, if for no other reason than I generally avoid public events because I generally avoid the public. Unless there’s a petting zoo. As long as I can enjoy a tall, cool Banks DIH Premium, I’ll be sound as a pound (research!). Does a pop-up count for the quest? In theory one could … pop up (arf) anywhere, even outside London (the provinces, swoon). But surely the point is that while they can pop up out of London, they always do pop up in London, as London attracts this sort of diversity. Frankly I don’t give a monkeys if you disagree, it goes up on the Big Board. 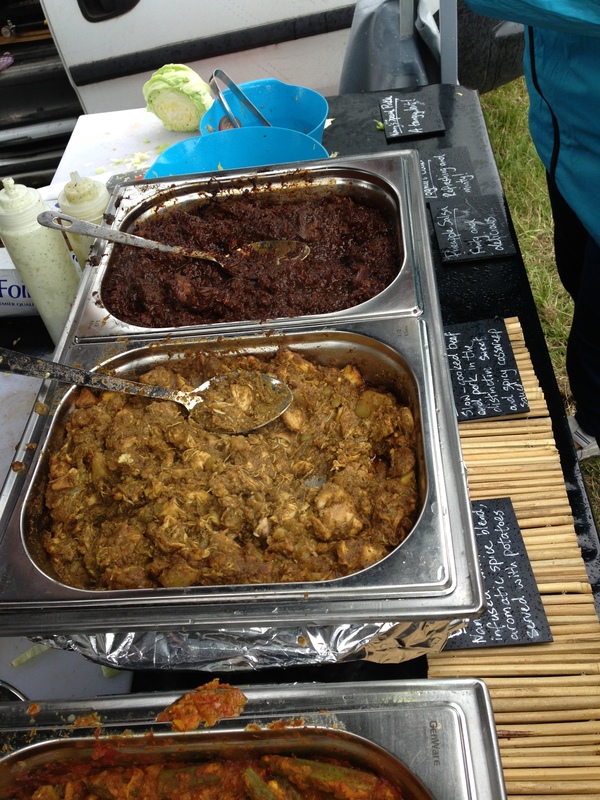 Pepperpot beef (top) and Berbice Chicken (not top). Not pictured: shivering, damp, umbrellaless masses. Screw you British June. Screw you. Shrimp ‘n’ Okra and Pumpkin Talkai, two of my favourite eighties hip-hop troupes. The menu. Or le menu as they say in Guyana when taking French lessons. 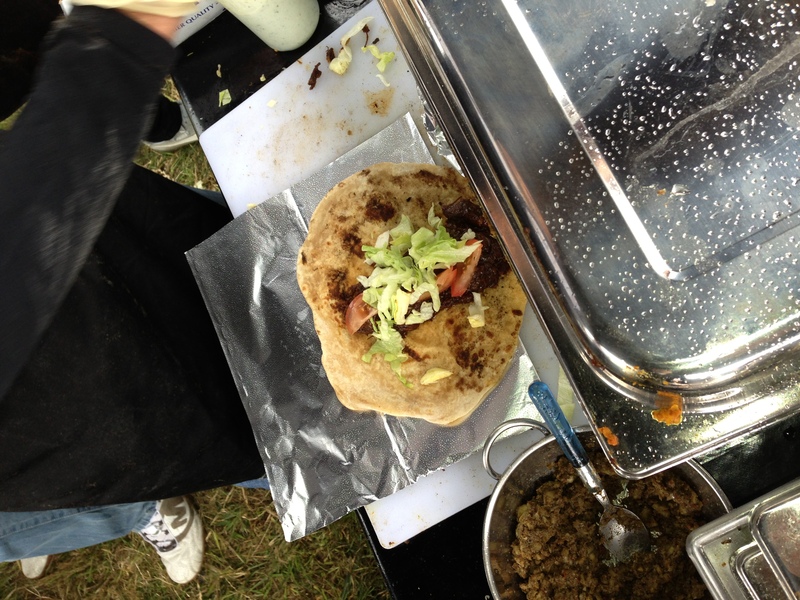 Not a food station in a Balkan refugee camp; a pop-up restaurant on Wimbledon common. Screw you British June. 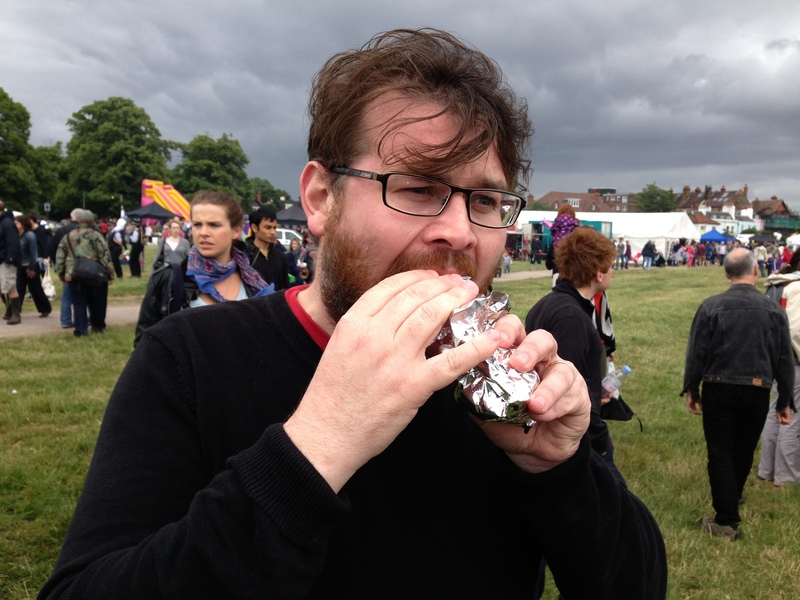 Man wins first place in roti-eating contest; loses everything else.